I know what you mean. I was widowed in May, and my boss was discussing my performance with me. He didn't understand why I was having difficulty working with my new "unsympathetic" supervisor. She had told me that she thinks she can "fix" me, and proceeded to tell me she'd been divorced a few times. He defended her by saying that for some, divorce is as traumatic as the death of a spouse, especially if the one suffering the distress didn't want the divorce. Um, divorced a few times, I'm assuming she's the problem. I felt so betrayed after hearing that... I loved my husband emensely, we had plans for children, our future. He died in combat in Afghanistan. I would never be so ignorant to tell someone, "It's as traumatic as divorce." It's tough enough having to function at work without having to endure such insenitivity and lack of support! We never cease to be amazed at the clueless remarks that sometimes come from suppossedly well-meaning people. We really understand how painful this situation must have been and appreciate your having shared your experience and reactions with us. What if someone did not want the divorce to happen...devasted. Is it not the same as losing someone who was special to you? Just saying. I have a girlfriend who broke up with her long term boyfriend but kept friends with him for ages after and I have lost count of the number of times she uses the term single for us both and makes stupid comments. Like the one about dating new people and how hard it would be to discuss her past, ie a break up. 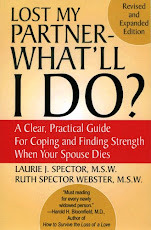 Try bringing up the fact your partner died! Thats a bit of a conversation ender and quite different. I would love to have broken up with my partner and stayed friends, I never got that luxury of having him my life still. Divorce and break up are devastating but radically different. We agree. While both experiences are painful,death,unlike divorce, is FINAL. Thanks for your comment, Prussia! I think the point is that upon losing a spouse, you can never hear their voice again. You envision them walking through the door and that will never happen again. Normally with a divorce, you don't want to engage with the former spouse. It's different. Also, one of the most well-intentioned but obviously pointless questions; "How are you?"